Tile can transform a basic shower into something luxurious and stylish. Instead of staring at boring, white walls, you can have a tile mosaic or a look that’s appropriate for a designer showroom. But if you don’t take care of your shower tile, you’ll be looking at a wall of mildew or nasty staining instead. Not all tile is appropriate for a shower. Tile is a popular choice for showers because it is mostly impervious to water damage and it’s easy to clean. But you may not realize that not all tile is actually rated for wet applications. Some material is more porous, and if you put it in a shower, it will become easily stained, retain bacteria, and fail prematurely. Some pre-designed tile sheets include smaller blocks of different tiles of varying textures and sizes. The inconsistency makes it easier for water and dirt to get trapped between the small tiles, making these sheets a poor choice for showers. You may not even know that you have the wrong tile in your shower until you talk to a company about shower tile cleaning near Gilbert and you get the bad news. The company may be able to revive the shower with professional cleaning, but the fix will only be temporary if the tile is not appropriate for the shower. Mortar is the glue that keeps the tile attached to the walls and the floors in your shower. It is troweled on to the surface, and then the tile is applied on top of it. Mortar is not the same as grout, which is applied between the tiles after the mortar dries. Not only does mortar create a strong bond so that the tile does not come loose, but mortar also works with grout to create a waterproof seal between the tile and the subfloor or wall. The grout alone is not strong enough to keep all the water and debris out. If there are gaps in the mortar, the shower will be vulnerable to water damage. Again, you may not even realize that insufficient mortar application is a problem until you are looking at replacing your tile, unfortunately. Standing water is the enemy of tile. Your shower should be designed so that the water raining down on the floor easily runs toward the drain. Without the proper slope in the shower bottom, the water will pool and stagnate. Over time, that will lead to mold and mildew growth, as well as nasty staining. Without attention, the standing water can also break down the grout and penetrate to the subfloor and walls. Fortunately, regular shower tile cleaning and Gilbert shower tile sealing can keep your shower looking good, but you’ll feel like you’re constantly battling mold and stains. If you notice standing water after you’re done with your shower, or if you feel like you’re constantly working to keep your shower clean, it might be time to call in a professional to evaluate the construction of your shower. Grout and regular sealing can certainly protect your shower from a lot of ills and help extend its life. But assuming that healthy grout and intact sealer are all you need will set you up for a lot of heartache – and cost you a lot of money. The shower needs to have been built properly, with the right tile, the right slope, and the right application of materials. Then you need to maintain the shower properly, including regular cleanings and adequate ventilation. In addition to your own cleaning, you should hire a company for professional shower tile cleaning in Gilbert to get the stains that have set deep in the tile. With the right care, your shower tile can last a lifetime, and it can look beautiful for all those years. Develop a maintenance plan that includes your own cleaning and periodic visits from a professional for cleaning and shower tile sealing. 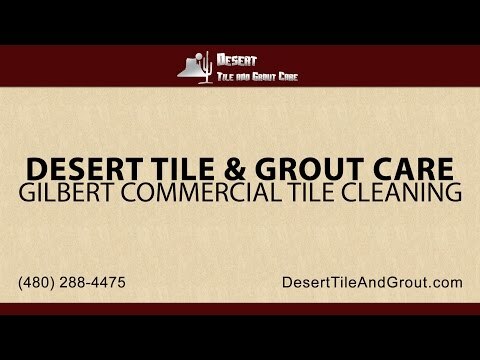 In Arizona, Desert Tile and Grout Care offers the shower tile cleaning and sealing services that Gilbert Area residents trust. Our shower tile restoration services can make a stained and dingy shower look like new, helping to correct problems that even poor installation caused. Our friendly professionals will also give you feedback about your shower, including whether there are structural issues that need to be addressed for improved maintenance and appearance. Call us in Arizona today to schedule an appointment for your shower tile restoration, cleaning or grout sealing. How Often Can I Reseal My Tile before Replacing It? Read the rest of How Often Can I Reseal My Tile before Replacing It?